Do you know that you can also take advantage of the benefits of green tea if you apply it topically? Place some small bags in the refrigerator and then over the eyes to reduce swelling. Here's a beautiful reason to stop by the supermarket today: certain foods have powerful ingredients that keep skin smooth and soft and help fight age-related damage. Thinking about what to eat? These foods will help you save your skin, know the 5 best foods for healthy skin. Strawberries have more vitamin C anti-aging per serving than orange or grapefruit . Research published in the American Journal of Clinical Nutrition shows that people who eat foods rich in vitamin C have fewer wrinkles and less dry skin related to age than those who do not. Vitamin C combats free radicals, which damage cells and break down collagen, leading to fine lines. For a smoother, more hydrated skin, a natural mask of strawberries is applied once or twice a week and foods rich in vitamin C are eaten every day. In a food processor or blender, combine 1 cup of frozen or fresh strawberries. Mix them with vanilla, 1 cup or plain yogurt and 1 1/2 tablespoons of honey (a great moisturizer) in an 8 oz glass. Enjoy the smoothie, leaving aside enough to cover your face . Apply the rest on your face and leave on for about 8 minutes before rinsing. The antioxidant and anti-inflammatory properties of olive oil not only benefit you inside, but are good for the skin as well. When used topically, the results of olive oil are a softer, more radiant skin. In addition, the consumption of olive oil, a staple food in the healthy Mediterranean diet, provides antioxidants to dismantle free radicals and reduce inflammation . In addition to using olive oil in your daily diet, apply a lip gloss and on the skin, as needed. If you have dry skin, topical application will have a great advantage. At dinner, sprinkle a few tablespoons of extra virgin olive oil in a small bowl and dip the whole grain bread into it to improve your skin from the inside out. F rotates a quantity of extra virgin olive oil on the lips to hydrate a dry wrinkle ; or use it in difficult times (elbows and heels), as needed. A cup of green tea does much more than relax. Green tea is full of antioxidants that fight inflammation. What's more, research by Case Western Reserve University and the University of Alabama shows that green tea consumption can reduce the risk of skin cancer. And when a generous trickle of citrus juice is added, the tea's antioxidants receive an energy boost that stays and benefits the body for longer. We need at least three cups of green tea every day for an antioxidant boost, but you can also apply it to the skin. Put tea bags in the fridge and put them in the eyes for 10-15 minutes. Green tea contains tannins that act as an astringent when applied to the skin and can help reduce swelling . The orange hue of the pumpkin is by carotenoids, vegetable pigments that fight against wrinkles and help neutralize free radicals in the skin, preventing damage to aging cells. The pumpkin is full of vitamins C, E and A, as well as powerful enzymes that help cleanse the skin. In addition, the pumpkin has moisturizing properties. In a food processor or blender, combine 2 cups of canned pumpkin, 4 tablespoons of low-fat vanilla yogurt, 4 tablespoons of honey and 1 teaspoon of pumpkin pie spices. If you want you can apply it to the skin, leave on for 10 minutes and then rinse . It is good to moisturize and soften the skin. 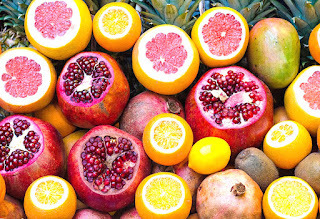 Pomegranates are one of the fruits richest in antioxidants. The juice of this fruit has more antioxidants that fight inflammation than red wine or green tea. Eating a little fresh pomegranate or juice fights aging. Apply to the skin once or twice a week to remove dead cells. In a food processor, combine 2 tablespoons of pomegranate seeds and 1 cup of cooked oatmeal. Transfer to a bowl and add 2 tablespoons of honey and 2 tablespoons of buttermilk. Apply on the face for a few minutes, then rinse. If you like this post then do share .